Genius is over-rated. Success is not just about innate ability. It’s combined with a number of key factors such as opportunity, meaningful hard work (10,000 hours to gain mastery), and your cultural legacy. Random factors of chance, such as when and where you were born can influence the opportunities you have. 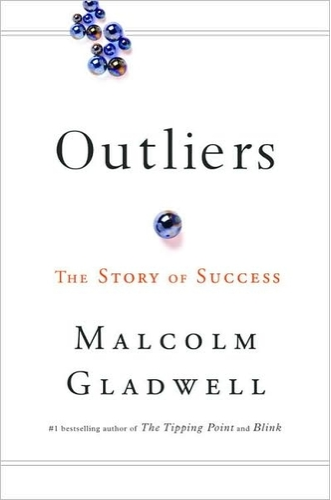 Gladwell brings alive his assertions primarily through the use of individual stories of triumph. -When opportunity presents itself, seize it. -There is no short-cut to mastery than ‘putting in the hours’. 2) Timing – Critical to success and opportunity. 3) Upbringing leads to opportunity – The quality of upbringing a child has been shown to be a key determinant on future success (even more so than pure IQ). 4) 10,000 hours – it typically takes that amount of time to ‘master’ something. People with opportunity have the chance to ‘do’ the 10,000 hours. Others don’t. 5) Meaningful work – If you feel there is real purpose to your work, it’s more likely you will work hard. 6) Legacy – Our Values drive our behaviour. Our values are often passed down from generation to generation (e.g. The Koreans are very deferential to authority, which led to a series of plane crashes; Asians reliance on rice meant they learned the value of hard work and perseverance – which shows through in their better ability at maths (also their language helps). Success is rarely found in the myths of rags to riches – rather there is a glimmer of talent identified, and then the door to opportunity is opened-up to the person (and not to others). That allows the gifted person the time and access to coaches, equipment etc to develop his/her skills, thus dramatically magnifying the difference between those with opportunity and those without. In looking at lots of different areas, from computing, business through sport, to music there seems to be a magic number of 10,000 – the number of hours ‘masters’ of their chosen area have put in. Where, and the year you were born can influence your luck/opportunity. In the list of the richest people in history, 14/75 are American’s born in the 1860’s and 1870’s. This was when the industrial revolution was taking off, and the railways were being built across America and Wall Street started up. The same happened in Silicon Valley. All the top IT entrepreneurs were born between 1953 and 1956. Those born in the 1890’s- to the early 1900 were less fortunate than those born after 1913. These people faced the great flu epidemic, the 1st World war, the great depression, and then were still young enough to be recruited into the 2nd world war (assuming one of the previous events hadn’t taken them out!). Likewise in 1935. There were 600,000 fewer babies born that year which meant smaller class sizes, a greater chance to get into the good sports teams, colleges and hence greater chance of getting a good job at one of the better firms. Involved parents – Sociologist, Annette Lareau studied 3rd graders in a long term ethnographic study. She concluded that involved parents vs. non-involved parents was the key difference that led to an individual’s success in life. Involved parents talk to their kids more and critically provide more opportunity for them (by taking them to museums, putting them into summer school, helping them with their homework etc etc). They also develop a sense of ‘entitlement’, so less likely to settle with the first ‘No’. Meaningful work makes you want to ‘put in the hours’. Sociologist, Louise Farkas studied the family tree of many immigrants and found that their offspring became professionals. She put it down to the fact that it was because of their humble origins not inspite of it that they did well – i.e. they had been raised in a family where hard work was valued and practiced. Our values are often unconsciously handed down to us from generation to generation, and as such cast long shadows over our current behaviour. Dutch Psychologist, Geert Hofstede analyzed different country’s cultural tendencies. He identified a number of different dimensions, such as Individualism-Collectivism (i.e. how much a country expects you to look after yourself), Uncertainty Avoidance (i.e. how well a country tolerate ambiguity) and Power-Distance Index (i.e. attitudes towards hierarchy). Top of that list (i.e. those countries most deferential to power/authority) are Brazil, Korea, Morocco, Mexico and Philippines, with the US, Ireland and S Africa the least in awe of power. This entry was posted in Behaviour change, Behavioural Economics, Decision making, Leadership, Management, Storytelling, Team building, Transformational teams. Bookmark the permalink. Thanks for sharing! The 10,000 hours to mastery is eye opening. I’m going to have to check out this book. This was a good quick read that I had to read for school, eye opening and entertaining I recommend it to both students and older readers simply because it provides good examples for essay structure as well as being interesting to older and younger readers alike. I love this book and was looking for a good synopsis of it. I hope you don’t mind if I share a link to your blog on Twitter.